Companions and their guests attended the meeting of Grassendale Chapter No 4808 at Woolton Masonic Hall, in order to join in a very special celebration. The event in question was the anniversary marking Peter Williams achievement of 50 years as a Royal Arch Mason. Pictured left to right, are: Andrew Whittle, Peter Williams and Sam Robinson. First principal Brian Boyle welcomed the visitors and with his co-principals John Leisk and Stephen Cornwell, opened the chapter and quickly conducted the routine business of the evening. Leading the celebration, was Assistant to the Provincial Grand Principals Samuel Robinson, whose request for entry into the chapter was announced by Provincial Deputy Grand Director of Ceremonies Arthur Cregeen. On his entry, Sam was accompanied by the Woolton Group Chairman Andrew Whittle, grand officer and celebrant Peter Williams and acting Provincial grand officer David Spear. After being given a warm welcome by the three principals, Sam occupied the first principals chair and thanked Brian Boyle and the companions for allowing him to occupy the first principals chair, for what was a very special occasion. 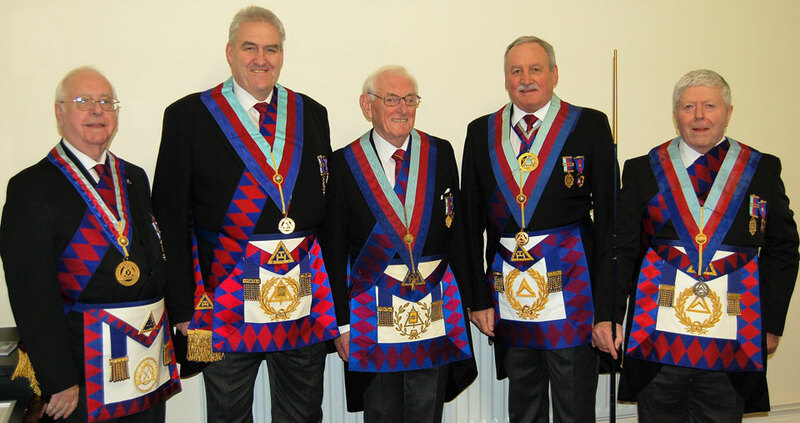 One of the most enjoyable duties of having senior rank within the Province, Sam said, was to preside over one of those very unique celebrations, when we celebrate a companion reaching a milestone in their Masonic career, on this occasion, 50 years of being a member of the Royal Arch, a golden jubilee. Sam asked PrDGDC Arthur Cregeen if he would place Peter Williams in front of him and ensure he was made comfortable. Sam began his address by saying, when he started researching about Peter’s background, he called him to arrange a visit to his home, it was quickly apparent there would be no need, as Peter said he had celebrated his Craft 60th in November 2018 and that most information was already available on the Provincial website. Peter was born on Friday 6 December 1935, a second son to John and Olwen Williams (nee Jones), who had met and married some five years earlier in Liverpool. Due to the impending war, Peter’s father John, had moved his family back to the Llandrillo area of North Wales, where Olwen’s family where from. John however was needed in Liverpool, as his work as a carpenter was much needed at the docks. This resulted in the family moving back to Liverpool, where they lived at 75 Arundel Street, Toxteth. Pictured left to right, are: Peter Williams and Sam Robinson. The 1930s was a harsh time to be born, with the collapse of the stock market in America and the consequent worldwide depression creating high unemployment. War clouds were also gathering, as Germany began to rearm, the Nuremberg laws were passed to strip Jewish people of their civil rights and Mussolini’s Italy attacked Ethiopia. In the 1930’s Alcoholics Anonymous was formed, by reformed alcoholic Bill Wilson, the game of Monopoly was released, the VW people’s car was launched in Germany and Persia was renamed as Iran. The Rolls Royce Merlin V12 piston engine also went into production and it later went on to power aircraft such as the Fairey Battle, Hawker Hurricane and Supermarine Spitfire, but mostly the Avro Lancaster Heavy Bomber. The engine remains in use today in aeroplanes involved in the Battle of Britain Memorial Flight and many privately restored aircraft. During the war, Peter attended Dingle Vale Primary School and at aged 12 moved to secondary education at Toxteth Technical College, or ‘Tocky Teck’ as it was known locally. However, at the end of the 1940s, Peter left school and took an apprenticeship as a joiner with J.W. Jones, at nine pence three farthings an hour, the equivalent of £1.30 at today’s values. Peter had always wanted to work on building site, so in 1954 at the age of 19, he went to work for Capstick and Owen, on a site in Whitby near Chester. Unfortunately, he had a disagreement with a two-inch nail, which bounced back after being hit with his hammer, resulting in damage to his left eye and the loss of his binocular vision. Peter then progressed through a variety of employments throughout the country, all associated with the construction industry and culminating in the post of district building surveyor for Liverpool. Peter was involved with the clean up after the Toxteth riots, the development and regeneration of the Albert Dock and Liverpool Festival Gardens. His career culminated with the implosion of the Netherley tower blocks. So, by the end of his working life in 1990, it can be said Peter went out with a bang. In 1958 Peter met Brenda Robinson (no relation to Sam), Brenda was brought up in Africa and worked as a secretary for the Canadian National Railway, they married 3 March 1962, at St Anne’s Church, Aigburth. They have a son David. Peter Williams responding to the toast to his health. Peter was exalted in 1968, a year which remains one of the most tumultuous single years in history, marked by many historic events. Robert F Kennedy and Martin Luther King were both assassinated and Richard Nixon became President of the USA. It was also the year of the Prague Spring, which came to an abrupt end with Russia invading Czechoslovakia, while the unpopular American war in Vietnam was all going pear shaped. But it wasn’t all bad news, Apollo 8 orbited the moon and the Beatles released their ninth studio album, simply named ‘The Beatles’, but more widely known as the White Album. Also, a then unknown band called Led Zeppelin were playing to a small crowd of Manchester students. Sam then briefly went onto Peter’s Masonic history. The year Peter got married, he was initiated into Pembroke Lodge No 1299 on the 18 September 1958, later he joined Sure and Steadfast Lodge No 9326 in 1989 and finally South Liverpool Lodge No 2681 in 2012, were last November Peter celebrated 60 years in the Craft. In the Royal Arch, by double dispensation, Peter was exalted into Pembroke Chapter No 1299 on 28 October 1968. The reason for the dispensation being the fire at Hope Street, plus the triple exaltation of Peter, his blood brother Allan and Thomas Lawton, all at the Grapes Hotel in Freshfield. 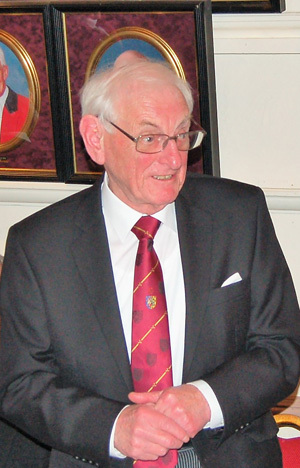 Peter then joined Grassendale Chapter in 2014, prior to the erasure of Pembroke Chapter. Later that same year, he was installed as first principal of Grassendale Chapter and became DC in 2015, an office he still holds today. Peter received his appointment to grand rank in the Craft as Past Assistant Grand Director of Ceremonies in 1996 and in the Royal Arch received Past Grand Standard Bearer in 1995. Peter was secretary of the Liverpool third group, then vice chairman, followed by two years as chairman. When the Liverpool groups were reorganised, Peter became the Woolton Group Chairman for a further three years. During his time in the group system, Peter ran trips to Paris and Brussels and hired a Mersey Ferry for a trip on the Manchester Ship Canal, raising over £10,000 for the 1997 ‘Festival for Girls and Boys’. Sam ended his delivery by saying “Peter during your life you have dedicated yourself to serving this city and your local community and you have devoted a huge amount of time to Freemasonry in the Liverpool and Woolton Groups in particular. You certainly seem to have derived a great deal of pleasure and enjoyment from it and so it is an honour and privilege to say thank you for all that you have done both in Freemasonry in particular and in the wider community in general. Many congratulations on achieving 50 years in the Royal Arch and I am sure we all look forward to seeing you enjoy many more years as a member of this great order”. Sam then asked Andrew Whittle to read the anniversary certificate from the Grand Superintendent Tony Harrison, to mark this special occasion, which he then formally presented to the celebrant. The formal business completed, Sam asked Brian Boyle to return to his rightful seat and with the remaining business of the evening concluded, the chapter was closed. The celebrations moved downstairs, where the assembled companions enjoyed a fine festive board and David Newland made a heartfelt toast to the celebrant. Pictured left to right, are: David Spear, Andrew Whittle, Peter Williams, Sam Robinson and Arthur Cregeen.